On March 11, 2018 at 4:00 p.m. 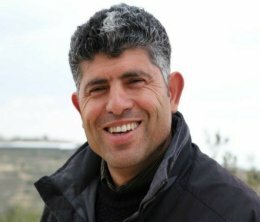 Faith United Methodist Church will host a very special guest: Mr. Daoud Nassar, one of the brothers whose family owns and operates the Tent of Nations (www.tentofnations.org), an educational and environmentally conscious farm located in the West Bank of Israel. The 100-acre farm located 6 kilometers from Bethlehem in the occupied West Bank, and is surrounded on three sides by Israeli settlements. The Nassar family has owned and operated the farm since 1916 – over 100 years. And yet, the family has been involved in a legal battle since 1991 when the farm was classified as “Israeli State Land” and thus threatened with confiscation. They want to retain what they believe rightfully belongs to their family, and they are working toward that goal in a peaceful and diplomatic manner. As an Ambassador of good will, Mr. Nassar travels to the United States and speaks at various venues under the sponsorship of an organization called Friends of Tent of Nations North America (fotonna.org). 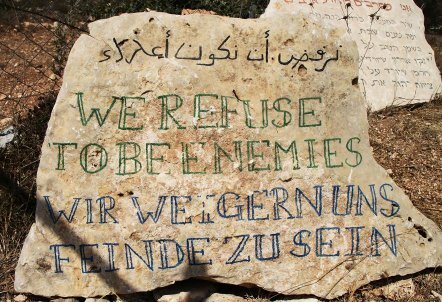 He shares the story of his family’s commitment to living a life of non-violent resistance and refusing to be enemies in the face of continuing obstacles that they, and most Palestinians, face in their search for a normal life. He holds a Bachelor’s Degree in Biblical Studies from the Bethlehem Bible College, a Bachelor’s Degree in Business from the Bethlehem University, and a degree in Tourism Management from Bielefeld University in Germany. He also speaks and understands several languages, including Arabic, German, Hebrew, and English. During our Holy Land Pilgrimage last October, David and I visited the Tent of Nations farm. We met with Daoud’s brother, Daher, and learned about the difficulties their family and Palestinian friends in the region face every day. We were struck by the family’s commitment to peaceful resistance and their desire to create a space where people of all nations, races, and religions can meet, learn, and work together. They refuse to be enemies and instead choose to channel their pain and frustration with an unjust system into positive actions that will build relationships and a better future. Mr. Nassar will be speaking at Faith United Methodist Church, located at 8640 N. 19th Avenue, Phoenix, AZ on March 11 at 4 pm. His presentation, which will include time for questions and answers from the audience, will be followed by a meal (at the nearby Sweet Tomatoes restaurant) during which we hope our conversations with Mr. Nassar and each other will continue. As part of the church’s commitment to building bridges through understanding and dialogue, we look forward to Mr. Nassar’s visit and invite people from other churches and the community to attend. Donations will be accepted at the event to help cover Mr. Nassar’s travel expenses.